After the start of the Roman rule in Judaea and fall of the Hasmonean empire in 63 BC. The rulers of Judaea tried in vain to maintain the templecult in Jerusalem in position. We can read in the books of Flavius ​​Josephus, Antiquities and War of the Jews that this attempt ultimately failed. The Temple eventually was destroyed during the Jewish Revolt in 70 AD. From the works of Josephus and the large amount of secondairy literature that has been written about this topic, we can conclude that the Temple of Jerusalem had a large role in binding the people within the Jewish community. In network terms, the Temple operated like hub that connected many communities (nodes). Even today the Temple still has this imagined role for many people. The Romans however were not able to establish a connection with this hub in Jerusalem and they didn’t succeed to integrate the Jewish population into the Roman Empire. Therefore the Temple faced her ultimate fate of destruction. The main question that in this point of view arises: What were the reasons that the Temple of Jerusalem could not be integrated into the network of Rome and how did the Temple undermine the Roman authority in such a way that ultimately it led to the destruction of the Temple? The history of the Temple in Jerusalem is a long one and it starts near 1000 B.C. when Solomon, the successor of the notorious ancient king David, built it. 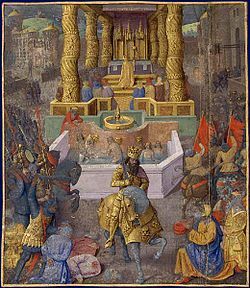 From that time on the Temple gained a strong influence in the region until it was destroyed the first time by the Babylonian king Nebuchadnezzar in 550 BC. When the Persians conquered the Babylonian empire it was the Jewish allowed to rebuild their Temple. From then on we enter the second temple period. Gentiles, Jews and sects like the Pharisees, Sadducees and Essenes they all brought their offerings to the Temple at least three times per year. The Temple was in this aspect a huge binding factor between different ethnic groups and Jewish sects in Judaea, and even more for all the Jewish people all around the world. The Temple gave the region an identity, the Jewish identity. The High priest and the counsel of the Temple, the Sanhedrin, gained in their roles as leaders of the Temple a very strong influence and power over the Jewish population. This power was mainly built on the collection of religious taxes, the temple tax, of half a shekel a year, and maintaining the religious laws which every Jew and cult had to obey. The wealth that was stored in the Temple building was therefore of an unprecedented scale. When the Roman general Pompeius subordinated Judaea to Rome in 63 BC the new rulers faced a huge struggle to gain power over the Temple. The Jews were very strict in obeying their religious laws and were averse to any other authority than the authority of the Temple and its rituals. In the run up to the destruction of the Temple we see the rulers of Judaea deal differently in success with the power and influence of the Temple of Jerusalem. After the fall of the Hasmonean Empire the new rulers were mainly vassal kings installed by Rome and Roman governors or procurators. After the invasion by Pompeius the first rulers in power where Antipater and the late Hasmonian king Hyrcanus II. This two men were able to obtain many favors from the Romans to the Jews in such a way that the sovereignty of the temple was largely maintained. The son of Antipater, Herod the Great, succeeded Antipater and Hyracanus. In a similar way as his father did before him, Herod knew how to maintain good relations with the Roman Empire. Herod built many buildings and founded even new cities in honour of the Roman rulers. For the Jews he rebuilt and enlarged the Temple, an effort that took more than forty years to accomplish. 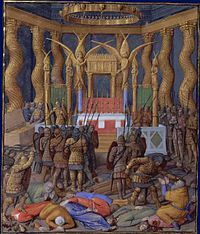 Although among the Jewish population there was an increasing resistance against the high taxes imposed by Herod and also against the origin of the Idumean ruler (as a converted Jew he was little appreciated), we see Herod in a certain way being successful in giving Jewish culture a place within the Latin Roman world. After the death of Herod the Great we see the Romans losing their grip on Judaea. The Romans deposed the immediate successors of Herod in 6 AD and Roman procurators and governors took over the task of the vassal kings. By the misconduct of the Roman procurators and the burden of the taxes, forty years after the death of Herod, several small revolts broke out. In the hope that Agrippa, the grandson of the late king Herod and the Hasmonean princess Mariamne, could restore the relationship between the Jews and the Romans, he was put into power in 41 AD. Because of his Hasmonean origin and because he had been a scholar in Rome during his youth, Agrippa I and as well a later successor Agrippa II succeeded several times to temper the conflicts between Rome and the Jewish people. But eventually they couldn’t prevent that in the coastal city Ceasarea a revolt broke out in 66 AD. The Jewish insurgents chased the Roman general Cestius Gallus out of Judea and the war with Rome had begun. Flavius Josephus has written the outcome of the revolt in his book War of the Jews. The insurgents were able to stand for some time the Roman legions in the heavy fortified fortresses and cities, which were mostly built during the reign of Herod the Great. But eventually the wall collapsed. The second Temple was destroyed and the bulwark that unified the Jewish people was pulled down to the ground. This marked the end of an era and would be the beginning of the emergence of synagogues and Christianity. From the introduction and the large amount of literature that has been written about this topic, we can conclude that the Temple of Jerusalem had a large role in binding the people within the Jewish community all over the world. In network terms, the Temple operated like hub that connected many communities (nodes) within the Jewish community. Even today the Temple still has this imagined role for many people. The Romans however were not able to establish a connection with this hub in Jerusalem and they didn’t succeed to integrate the Jewish population into the Roman Empire. Therefore the Temple faced her ultimate fate of destruction. In the literature there aren’t many examples at hand where the Temple is placed into the field of network theory. In my research however I have tried to place the Temple into a network perspective. In my paper I try to make clear that a connection between two hubs, the one of Rome and Jerusalem, could not be established. In this perspective Rome reduced Jerusalem and the Temple in terms of network theory from hub to network node. The main question that in this point of view arises: What were the reasons that the Temple of Jerusalem could not be integrated into the network of Rome and how did the Temple undermine the Roman authority in such a way that ultimately it led to the destruction of the Temple? Header: Reconstruction of the view across Jerusalem towards the Temple built by Herod the Great. Josephus, Flavius. 2010. De joodse oorlog & uit mijn leven. Trans F.J.A.M. Meijer and M.A. Wes. Wommelgem: Veen Bosch & Keuning uitgevers. ________. 2011. De oude geschiedenis van de joden. Trans F.J.A.M. Meijer and M.A. Wes. Antwerpen: Veen Bosch & Keuning uitgevers. Baumgarten, Albert I. 2009. How experiments end. In Jewish identities in antiquity, ed. Lee I. Levine and Daniel R. Schwartz:147-162. Tübingen: Mohr Siebeck. Berlin, Andrea M. 2002. Romanization and anti-romanization in pre-revolt galilee. In The first jewish revolt, ed. Andrea M. Berlin and J. Andrew Overman:57-73. London: Routledge. Freyne, Sean. 2002. The revolt from a regional perspective. In The first jewish revolt, ed. Andrea M. Berlin and J. Andrew Overman:43-56. London: Routledge. Goodman, Martin. 1987. The ruling class of judaea. Cambridge: Cambridge University Press. ________. 2007. Rome & jeruzalem. The clash of ancient civilizations. London: Penguin Books. Gruen, Erich S. 2002. Roman perspectives on the jews in the age of the great revolt. In The first jewish revolt, ed. Andrea M. Berlin and J. Andrew Overman:27-42. London: Routledge. Levine, Lee I. 1998. Judaism & hellenism in antiquity. Conflict or confluence? Seattle: University of Washington Press. ________. 2002. Jerusalem: Portrait of the city in the second temple period (538 b.C.E - 70 c.E.). Philadelphia: The Jewish Publication Society. ________. 2004. The first-century synagogue. Critical reassessments and assessments of the critical. In Religion and society in roman palestine. Old questions, new approaches, ed. Douglas R. Edwards:70-102. Abingdon: Routledge. Rappaport, Uriel. 2009. 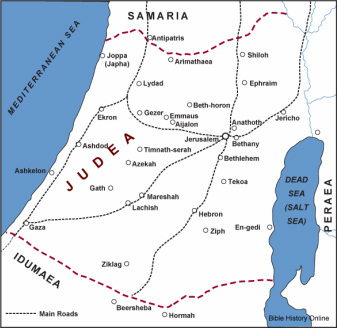 The connection between hasmonean judaea and the diaspora. In Jewish identities in antiquity, ed. Lee I. Levine and Daniel R. Schwartz:90-100. Tübingen: Mohr Siebeck. Rives, James. 2005. Flavian religious policy and the destruction of the jerusalem temple. In Flavius josephus and flavian rome, ed. Jonathan Edmondson, Steve Mason and James Rives:146-166. Oxford: Oxford University Press. Schwartz, Daniel R. 1990. Agrippa I. The last king of judaea. Tübingen: J.C.B. Mohr. Udoh, Fabian E. 2005. To caesar what is caesar's. Tribute, taxes, and imperial administration in early roman palestine 63 b.C.E-70 c.E. Providence: Brown University.